32 oz. food grade measuring cup is attached to the tank lid so you no longer have to search for a container. Garden hose port secures hose for safe and easy filling with one person. 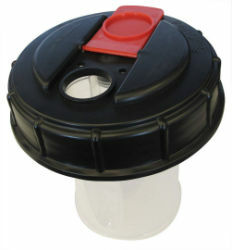 Fits sprayers with a 5” tank lid (15 and 25 gallon tanks).